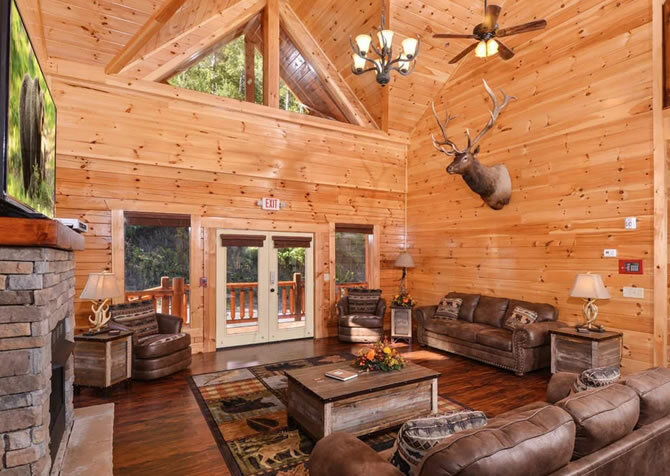 This luxurious and spacious cabin boasts amazing amenities - inside and out - is a fantastic group getaway for any family vacation, retreat, reunion, or group of friends. 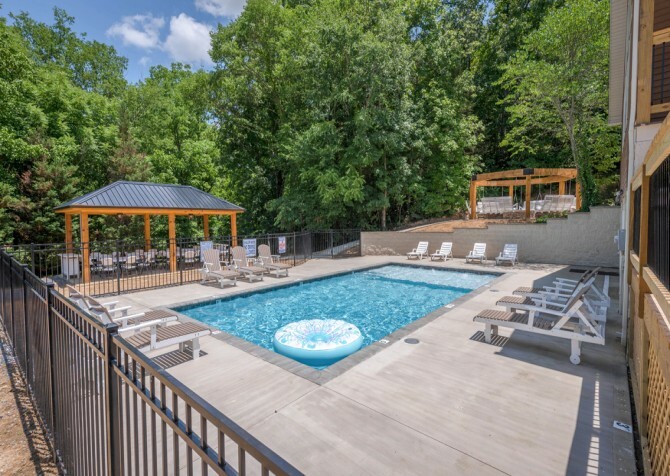 You'll be welcomed by a beautiful new front porch and fresh landscaping before stepping inside to new furniture and plenty of extras like big screen TVs, games, and more! Of course, you'll have all your favorites here, too, including the game-loaded rec room, spacious bedrooms, a lovely kitchen with multiple dining tables, and a convenient location just about 10 miles from downtown Pigeon Forge! There, you'll find a variety of group attractions, restaurants that cater, and large meeting spaces—just a few good reasons to plan your group retreat to the Smokies this year! You'll love relaxing inside the cozy living room of Keaton's Firefly Meadow, especially after an afternoon of whitewater raftingon the Pigeon River. 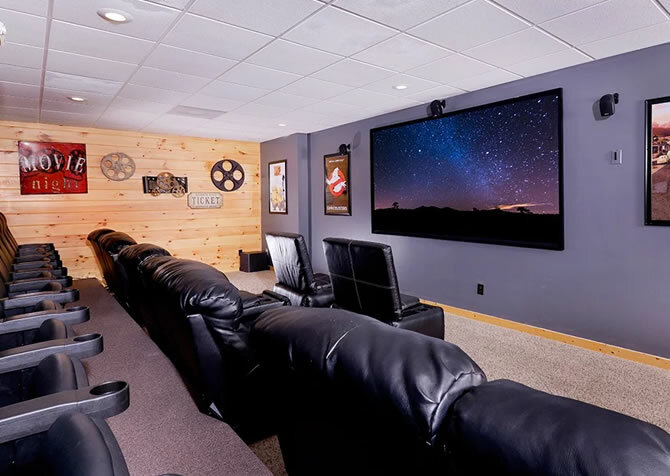 Choose one of 3 leather couches to kick back on, rest your drink on the coffee table in front of you, and turn on a classic movie with the big screen TV and DVD player provided by this cabin. If you're hoping for some quiet time, the natural light spilling in from the lovely cathedral window overhead makes this room perfect for reading that book that's been on your shelf for months. Keaton's Firefly Meadow also provides large windows across the front wall of the cabin and easy access to the front porch. With a group of 30+ guests, you're going to need more than one sitting area, and that's why Keaton's Firefly Meadow also provides a family room on the main floor. A full-size couch, loveseat, and oversized chair turn this space into a cozy spot for swapping memories, reading a book, or playing a favorite board game on the round coffee table in the center. If a quiet afternoon with Smoky Mountain sweets and treats is what you're after, be sure to ask about our Spirit of the Smokies gift basket. You'll enjoy local taffy, hot cider, corn cob jelly, pumpkin butter, and more inside this unique Cabins for YOU add-on. It's the perfect way to celebrate a special occasion with friends and family while you're in the Smokies. At the heart of the main floor is this lodge's walk-through kitchen. 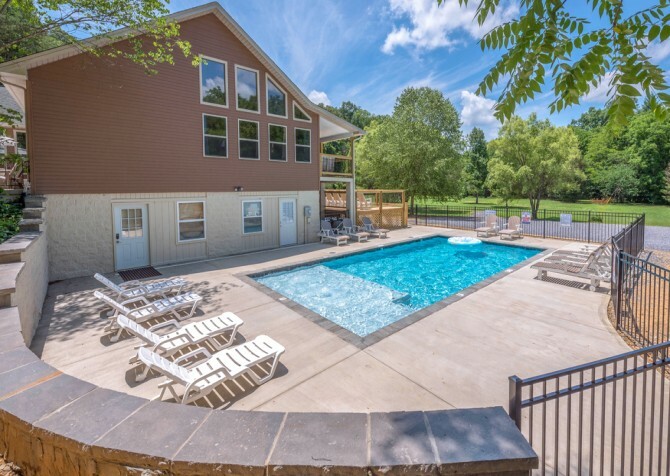 With all your major appliances in black—plus countertop essentials like coffeemakers, a double toaster, a blender, and a slow cooker — Keaton's Firefly Meadow makes it easy to plan for group meals during your Pigeon Forge getaway. We recommend casseroles, big pots of soup, or grab-and-go meals like deli subs, all of which are easy ways to feed 38 guests without breaking the bank. Don't forget, too, that many Pigeon Forge restaurants offer banquet accommodations and catering. Check out places like Calhoun's and Salsarita's, where you can get catering to bring back to the cabin. When it comes to the dining room inside Keaton's Firefly Meadow, it's hard to pick only one location. That's because this cabin offers several dining tables spread out on the main floor, making mealtime easy even for your big group! Inside a private nook with windows all around you'll find a traditional wooden table with place settings for 8. Nearby, just off from the kitchen, you'll find a black-and-tan table that can also accommodate 8. Finally, a round table for 4 can be found close to the living room, serving as a place to share meals or play a game of cards in the evening. For even more dining options, don't miss the twin dining sets on the patio. Each table comes with 3 chairs and its own umbrella, providing a comfortable spot to enjoy each other's company surrounded by Smoky Mountain trees. On sunny days in the mountains, you'll appreciate meals from the comfort of your cabin in Pigeon Forge. If you thought the living room and family room were enough, then you'll be pleasantly surprised to know that Keaton's Firefly Meadow also offers a large rec room! A perfect hangout for kids, teenagers, or a small group of adults, this versatile space offers plenty of options for indoor fun. Play a round of pool or a game of foosball. Watch a movie on the huge flatscreen positioned in the corner. Bring a deck of cards for a Poker tournament with the guys, or have the kids pack their favorite board games for a night of old-fashioned fun. 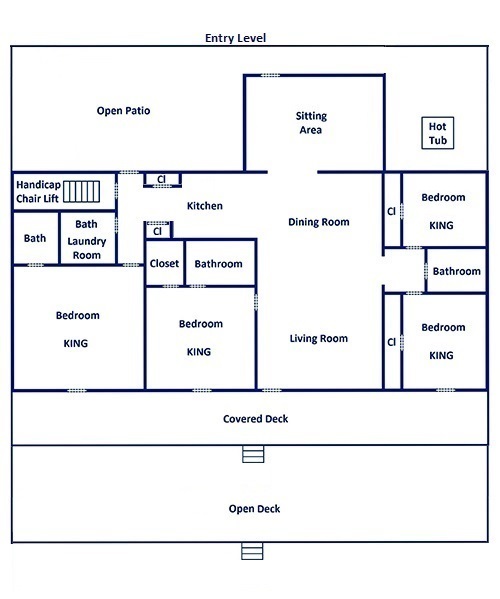 You're sure to love this rec room for its spacious layout and variety of entertaining options. Finding a space for everyone in your group to get a good night's sleep will be easy inside Keaton's Firefly Meadow. That's because this huge cabin offers 7 bedrooms and 5 brand-new bathrooms (giving you 8 1/2 total bathrooms). The rooms offer a variety of bed sizes and options, including kings, queens, and 6 new queen-size bunks. The bunk room even boasts an open floorplan, making it easy to keep an eye on the littles as they play and rest! With this kind of versatility, you'll be able to spread your group out however works best for you. 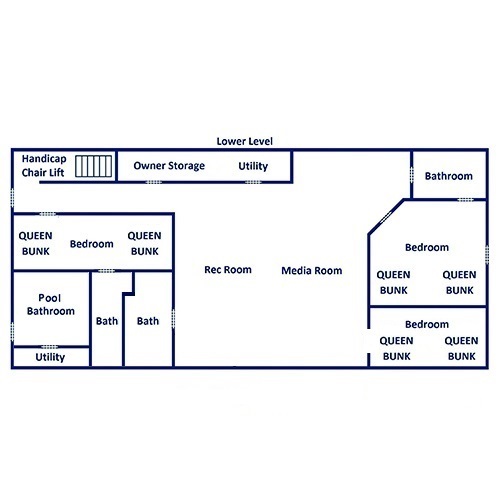 For your convenience, each bedroom comes with its own 65 to 80-inch TV, and several offer homey additions that include ceiling fans, dressers, nightstands, and reading lamps. 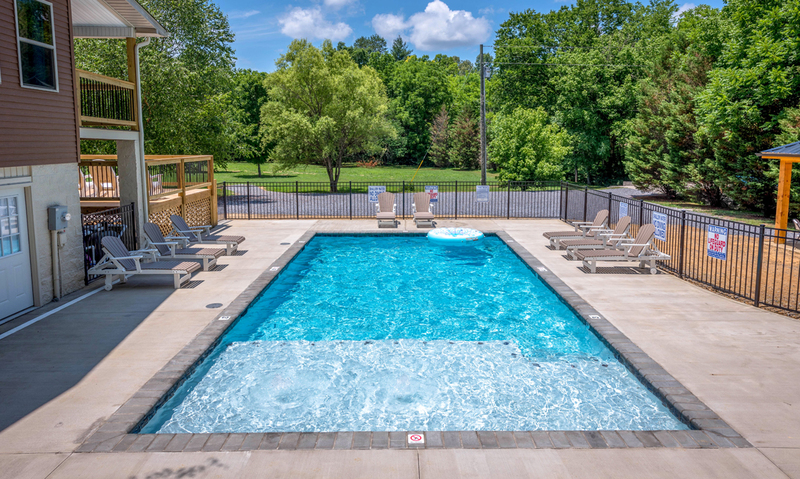 When it comes to Keaton's Firefly Meadow, some of our favorite features and amenities are the ones you find before you open the front door. We're talking about this cabin's private outdoor pool and large, flat yard! The new in-ground pool, open Memorial Day through Labor Day, will be a necessity if you're visiting Pigeon Forge during the dog days of summer. 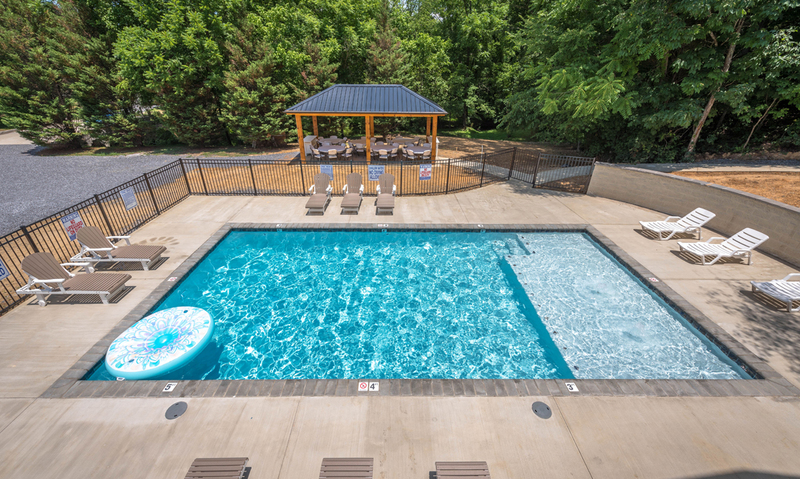 The 18x36 pool boasts a shallow lounge area with jets, so you can swim and unwind! Another incredible feature of Keaton's Firefly Meadow is its huge, grassy yard with plenty of room for corn hole, badminton, or any other outdoor game your family loves to play. You can even bring a football and plan for a Thanksgiving Day tournament or simply gaze over the front yard in the morning, scanning for turkeys, deer, and other wild animals that make their home in the Smokies. Other outdoor amenities provided by Keaton's Firefly Meadow include a gas grill, rocking chairs, a porch swing, and an outdoor hot tub. 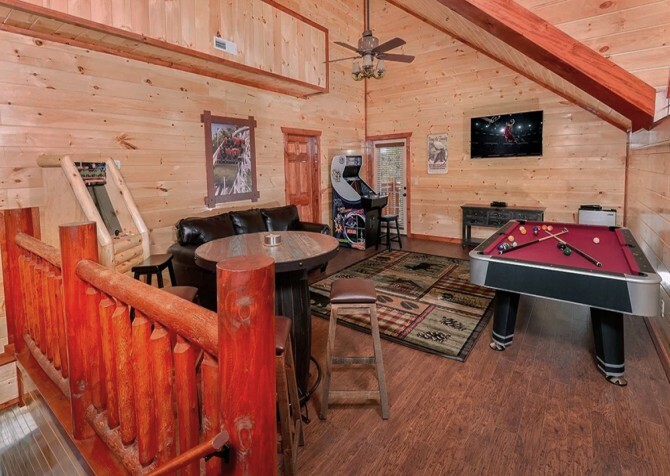 Plan to spend time in the great outdoors with your friends and family during your stay at this Pigeon Forge rental. 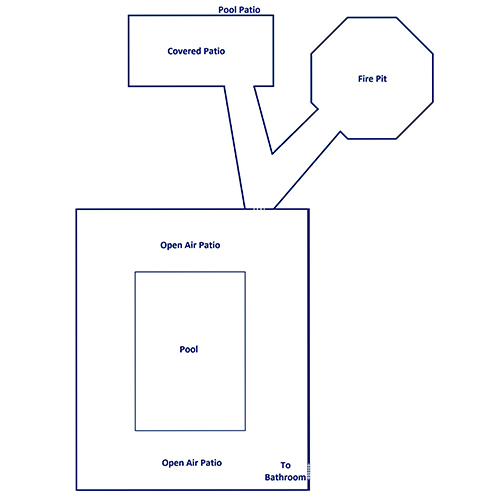 And don't forget the gorgeous new fire pit area, with swings and seating for 24! Besides its large yard and spacious layout, Keaton's Firefly Meadow offers some other great amenities: a discounted rate at the golf course located only 2 miles from the cabin; an electric (heat) fireplace, perfect for those cool evenings in the mountains; high-speed wireless (so you can keep up with our Cabins for YOU blog); a washer and dryer; and a flat, gravel driveway with nearly unlimited parking space. Be sure to plan your next large group getaway to Keaton's Firefly Meadow! The Smith Family Dinner and Show features music of all varieties (from bluegrass to oldies rock 'n' roll), clean comedy, and amazing impersonations of your favorite stars. For more than 2 decades, Country Tonite has been entertaining Smoky Mountain guests with its award-winning, family-friendly show! Original productions and a feast of biblical proportions are 2 of the features that set this Pigeon Forge theater apart from the rest!